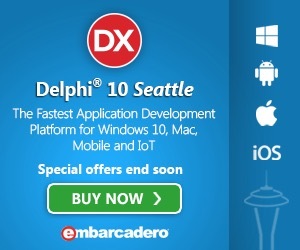 It is for Delphi, C++ Builder and RAD Studio XE3. Today I was reading a few blogs and questions on various forums. This made me thinking about writing some parial answers to this question: How to write a good application using Delphi? One big mistake the newbie is doing when he starts programing with Delphi is to create a form with his user interface and put all processing in the form’s events handler. This results in huge forms where reusability and testability are very poor. Instead, create a classes or components to encapsulate the items your program is managing and create methods to handle processing. Of course, when you design classes or components, there are things that should not be done within the class, for example getting some runtime value, storing results, displaying warnings, and more. All those tasks can be done in line by triggering an event. Operator overloading is a mechanism which gives you control over what an operator does on a given data type. Applied to a record, you can use it to provide a transparent conversion from one data type to another. The example code I will show in a moment comes from one of my applications (simplified version for brevity). I have a system which requires a parameter representing a value usually expressed as a string but actually at the low level is represented by a byte. The byte value can be in the range 0 to 5 while the usual string representation is like a capacitor value. The string value can only take 6 different values: 0.25pF, 0.5pF, 1pF, 2pF, 4pF and 8pF. (“pF” stands for picofarad where farad is the capacitor measure unit). This could looks strange to you but believe me, the user really likes that strings. In my application, there are places where I have the string representation and other places where I have the byte representation. As you can guess, everything is working as expected. The compiler magically calls the correct function I have defined. The lines with “class operator implicit” redefine the set or get value for the record. I made 4 variations in order to have TData to/from string and integer. Of course, you may add as many data type couples as you need. The line “class operator Inc” redefines the “Inc” operator. Complete source code is below. Create a new VCL Form application, drop a TButton and a TMemo on the form and use the code below. This article presents a generic class implementing a high speed queue. It has been specially designed for communication use but can be used for anything else. The code itself is quite short! Thanks to the efficient Delphi language. About high speed: Initially, I had an issue with performance in a communication system where a process was producing messages to be handled and another process was processing the messages. The two processes are totally asynchronous. I use the term "process" not to refer to different programs, but to different units of a single program. The bottle neck was coming from memory allocation. Record where allocated by the producer process and freed by the processing processes. This resulted in a large amount of memory being allocated freed. I designed this class to avoid as much as possible memory allocation. The design makes use of a several doubly linked lists of "buffers". The buffers are actually the data type specified by the generic type. Usually it is a record with a structure specific to the messages exchanged between the two process. If the application requires several types of buffers, then you should use a variant record to hold all types. We will see an example later. High speed comes also from the fact that you don't copy data except when really forced to. To avoid copying data, we use pointers. Data stay where it is, we access it thru his address. The compiler takes care of the details for us. A queue is a data structure in which you can append items (aka "node") at one end and remove items at the other end. This scheme is frequently named "First in - First out" or FIFO for short. You have another variant which append and remove items at the same end. That one is named LIFO which stands for "Last in - First out". In the application I described above, I need a FIFO queue. FIFO queues can be implemented in a lot of different ways. Here I selected a doubly linked list because in my context this is the fastest way doing it. A doubly linked list is a very classic data structure. Basically a doubly linked list is a variable number of items (or nodes) of any data type. One item is linked to the next using a pointer and linked to the previous using another pointer. There are two more separate pointers: one point to the first item and one point to the last item. To append items, we use the pointer to the last item and to remove items, we use the pointer to the first item. You can find a lot of articles about it everywhere on the internet. So I will only describe what make my implementation specific. Active items are those referring to the items added to the queue and not removed yet from the queue. They are actively waiting to be processed. Inactive items are those having already be processed. Instead of freeing the processed items, we put it in the inactive queue where they are waiting for reuse. When a new active item has to be created, before allocating one new item, the inactive linked list is checked and if not empty, an item is removed from the list and reused, that is moved to the end of the active list. If the inactive list is empty, then a new item is allocated. This has a tremendous impact on the performance: adding a large number of items take 30 mS the first time when they need to be allocated. Later, when they can be reused, it only takes 17 mS! Finally, the acquired items linked list is used when there are several processes consuming the same queue. For example when we have a multithread application and several threads are fetching messages from the same active queue. The third list is used to store one item extracted from the active list while it is processed so that another thread won't take the same item. After it has been processed, the "acquired" item is moved to the inactive list using a method I named Release. A generic class is a class which has a variable part not known when designing the class. In our case, the variable part is a record. I named the generic class TCommQueue. This is a totally arbitrary record made simple for this article. In a real application, this record will be much more complex with all the members required for your application. You see that using a generic type is very easy: you use the generic type name (TCommQueue here) and append your own data type in angle brackets ( here). The compiler will compile the generic class by replacing the parameter type with the one you supplied. Now it's time to see the declaration of TCommQueue generic class. Remember we are using doubly linked list which are defined here as nested data type. Nested data types are not related to generics, but are very handy in that case because nested data types within a generic class may make use on the parameter data type. // functions make use of pointers. // Return pointer to first item. Update current. // Return pointer to last item. Update current. // Return pointer to next item. Update current. // Return a pointer to the item after a given one. Update current. // Return pointer to previous item. Update current. // Return a pointer to the item before a given one. Update current. The generic class TCommQueue takes one parameter which is the data type you want to use for the items. Instead of I could have used. The difference is that the later allow any data type to be used for T while specifying "record" impose the constraint of have a non nullable data type, mostly a record but also a scalar type such as integer, char and the likes. You cannot use string, array, class nor interface. I imposed such restriction because memory is allocated/freed using new/dispose. The doubly linked list is declared as a nested data type at line 19. It is a record named TLinkedList. It contains two pointers to each end of the linked list, and a count of items in the list. I added a count because counting elements in a linked list is expensive: you have to iterate thru entire list to count how many node it has. Maintaining a counter is a useful optimization which doesn't cost much. The nodes or items of the linked list are made of a record named TLLNode defined. As you can see at line 15, it makes use of the parameter type to build the record. Remember, in a doubly linked list, a node is made of the actual data you want in the list plus two pointers to the next and previous node in the list. Lines 23 to 26 are method declarations for the record. Their implementation handles adding (append) or extracting (remove) nodes. This is only a matter of manipulation the pointers, no data is actually allocated, moved nor freed. This is really fast! At line 29, 30 and 31 are declared the 3 doubly linked lists we talked before. Since TLinkedList are records, there is no need to allocate/free memory. Line 31 declares FCurrent a pointer to an item. It is used in conjunction with the methods First, Next, Previous and Last that I implemented to iterate thru the list. Please note that those are NOT thread safe. The enumerator is NOT thread safe and copies the data which is bad for performance. The real interesting stuff is in methods Add, AcquireItem and ReleaseItem. They are all fully thread safe. Add will add an item to the queue (Active linked list), reusing an inactive one or allocating a new item. Add returns a pointer to the item. There are two overloaded versions of method add. One without argument and one with a method pointer argument. The version with the method pointer argument (line 48) is required to be fully thread safe. Allocating a new item in the queue may require initialization of the item. But initialization must take place before the item is visible in the queue otherwise another thread could remove it before it is initialized. The method pointer passed as argument is used as a callback (a kind of event if you like) which will be called within add method just after the new item is allocated or extracted from inactive list and just before it is actually appended to the active list. A last note about multithreading: we handle linked list pointers in the implementation. To be thread safe, the handling must make sure only one thread at a time can update any of the linked lists. This is why I used a critical section declared at line 33. The implementation is rather boring. It is actually very basic Delphi programming. I give the source below to be complete. Drop a message if you need some more explanations. Today is Delphi's 18th birthday. Delphi 1 started on February 14, 1995. I started to use it a little bit later and I'm still using it every day. I never regretted that decision. In 1995, Delphi was an extraordinary development tool and it is still today an extraordinary one in its latest incarnation: Delphi XE3. UPnP is a set of networking protocols that allows discovery of networked devices supporting UPnP. For example, you can easily discover printers, Wi-Fi access points, internet gateways, Streaming servers and many other types of devices. Microsoft Windows provides an API to use UPnP. This API is located in a DLL which basically exposes a COM interface. You’ll find the documentation on Microsoft MSDN website http://msdn.microsoft.com/en-us/library/windows/desktop/aa382303(v=vs.85).aspx. UPnP API is not complex to use but, of course, is not written the “Delphi way”. This is why I wrote a Delphi layer above the API to ease its use. I created an object TNetworkDeviceFinder which implement the call back functions that Microsoft API requires to discover UPnP devices connected on the network and expose the result as a set of properties and a single event. To get an abstraction level, I had the choice to write a component or an interface. I selected to implement it as an interface. Basically you may use my TNetworkDeviceFinder object as a simple Delphi object or as an interface. The later is easier. On this screen dump, you see the result of the search for “WD TV Live” on the network. As you can see in the result, this is a Western Digital streaming media player. The search has been done by model name. The combobox allows you to search by all other datas. Once you have discovered the device, you have at hand a lot of informations. For example, you have the PresentationURL which you can use to manage the device. You get the IP which can be used to access the streaming function. Another example: Here I searched for “Sagem” in manufacturer name. The result is related to my internet router. You can use the resulting PresentationURL to have the IP address and later use it to open a port for NAT traversal.